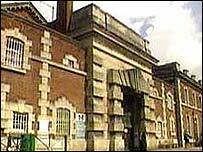 Exeter Prison is one of the most overcrowded in the country, according to new figures published on Thursday. According to the Howard League for Penal Reform, Exeter is the sixth most overcrowded in the UK and is currently at 170% capacity. The jail holds 537 people when it is designed to hold 316. The report also says that three people have committed suicide there since January 2004. But the Prison Service said the overall suicide rate was in decline. Senior research officer at the Howard League, James Lowe, said the situation was worrying. "The governors are the ones that have to manage the situation," he said. He called on the government to "make sustained efforts to talk up" the use of community penalties for certain non-violent offenders. The prison takes adult and young offenders committed to prison by courts from Devon, Cornwall and west Somerset.